See all your paid campaign results in a single PPC report! From campaign costs to the number of clicks, impressions to ROAS, your PPC campaigns involve many different KPIs. With our preset PPC report example, all you have to do is plug in your paid marketing data, and you’re all set to start reporting! 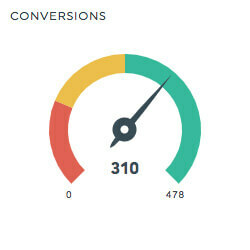 Our PPC report template includes the most commonly used KPIs. Plus, if you’ve got different ones in mind, you can swap them in easily! Want to automate your reporting? View your campaign data in our PPC report template! 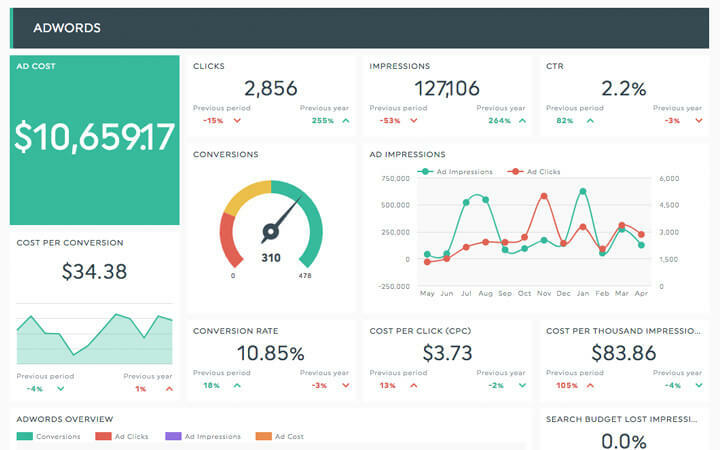 Plugging your own data from across a multitude of PPC tools into our beautiful PPC report template is as easy as 1-2-3! Include your Google AdWords and Bing Ads data… all in the same report! Choose the PPC / SEM report template from the drop-down menu, and you’re all set! In case Google AdWords and Bing Ads aren’t enough, DashThis connects to 30 other digital marketing tools too! 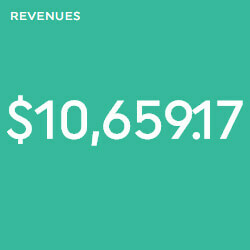 See your paid marketing data in DashThis today! Our automated PPC reporting tool enables you to save time by starting with our PPC report template, while still providing you with all the customization power you would expect from a reporting tool! Explore our PPC Reporting Tool! Show your PPC data the way you want with custom widgets! Pie chart? Historic chart? Trend widget? We’ve got it all! Send a PDF or web version of your report, or even set up an automatic email dispatch. Either way, your team and your clients will always know what’s going on! Our PPC report template can be entirely redesigned to fit your brand’s aesthetic, whether it’s a custom design, a custom URL, or both! No matter what kind of PPC report you’re creating, DashThis has the template for you! How are your Google AdWords campaigns paying off? Is your CTR what you were hoping for? What about your conversion rate? Your AdWords report holds all the answers. Gather your Bing and Yahoo paid campaign data in a Bing Ads report to see how your ads are performing on those channels. See how your visitors are interacting with your brand online, and compare the results among different browsers, landing pages, or devices. See which of your Facebook Ads tactics work, how your ads can be optimized, and how your money can be invested wisely in a Facebook Ads report template. See how your ad targeting is working for you on LinkedIn ads by tracking your conversion rate, number of impressions, engagement rate, and much more! 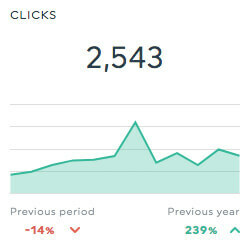 Track your ad clicks, conversion value, cost per click, and many more KPIs to see how your Instagram ads are performing. DashThis has a whole lot of templates used by hundreds of PPC marketers like you. Take a look! SEM reporting can seem pretty complex, but with our handy SEM report template, you'll be off to a running start! Track your performance, optimize your campaigns, and show your results with our comprehensive social media report template. Finding the right tone and message to send to your audience isn't always easy. Track your campaign results with our email report template!